To mark the end of the five-year incunabula cataloguing project, Ed Potten and Emily Dourish are editing a volume of essays on some of the treasures of the Library’s early printed holdings. 60 distinguished authors have submitted their pieces (see earlier posts on visits from Sir Quentin Blake and Sir David Attenborough) and the task of creating the page layouts is well under way. The final batch of books was taken to the photography studio last week, and some 400 images have been produced in total for the catalogue and other projects. These images will be of immense value in the future, for teaching, research and publicity purposes, and we are very fortunate to have an in-house Digital Content Unitand a very experienced Conservation team to assist with their creation. 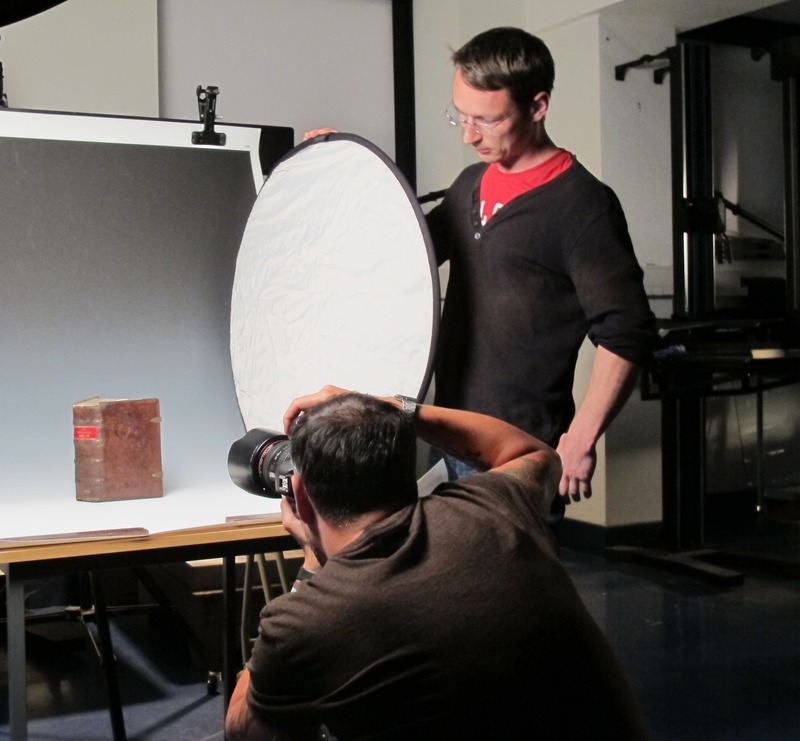 Preparing these books for the camera has proved a challenge; some of them are in fragile condition, requiring extremely careful handling. Others have been bound tightly by contemporary or modern owners; a few are printed on vellum, making the leaves themselves difficult to open. 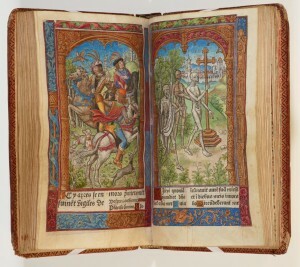 Some combine all of these challenges with the additional factor of illuminated imagery; the beautiful 1491 Book of Hours by Pierre le Rouge, printed entirely on vellum and with truly stunning coloured and illuminated woodcut illustrations, was one of the most difficult but rewarding of the whole project. 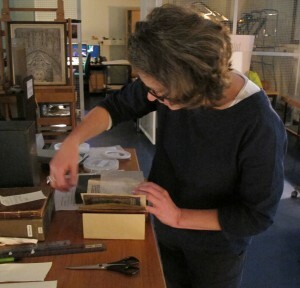 With help from specialists in the conservation and display of early books, the book was held open on a cradle and the pages gently held in place using friction-free polythene strapping and silk. This can be removed from the finished photograph using specialist imaging software, giving the impression of a book sitting open upon a desk for the reader. 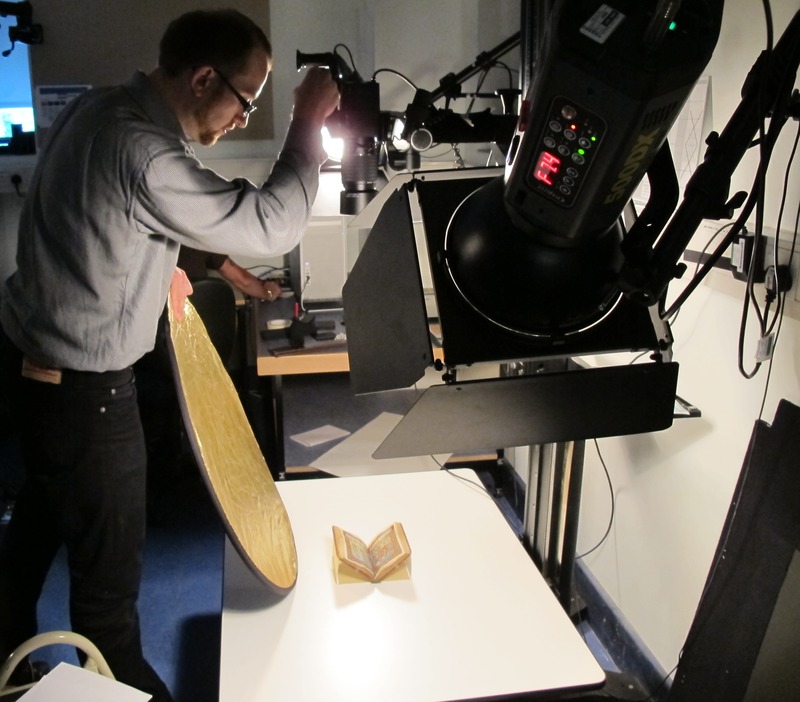 The photography staff then worked extensively on lighting the book, to ensure that the gold decorations would show up without over-bright reflections. The exquisite detailing, such as the highlights on the blue flowers in the woodcut borders, can be seen very clearly in the finished image (click the thumbnail to view full size). In some cases the author has chosen to write on the physical object, discussing provenance evidence. In the example here it is the binding of a volume which is of interest, giving so much information about who owned a book, where and when. 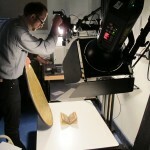 Even a book which is closed requires careful lighting, so that the impressions of binding tools can be seen. 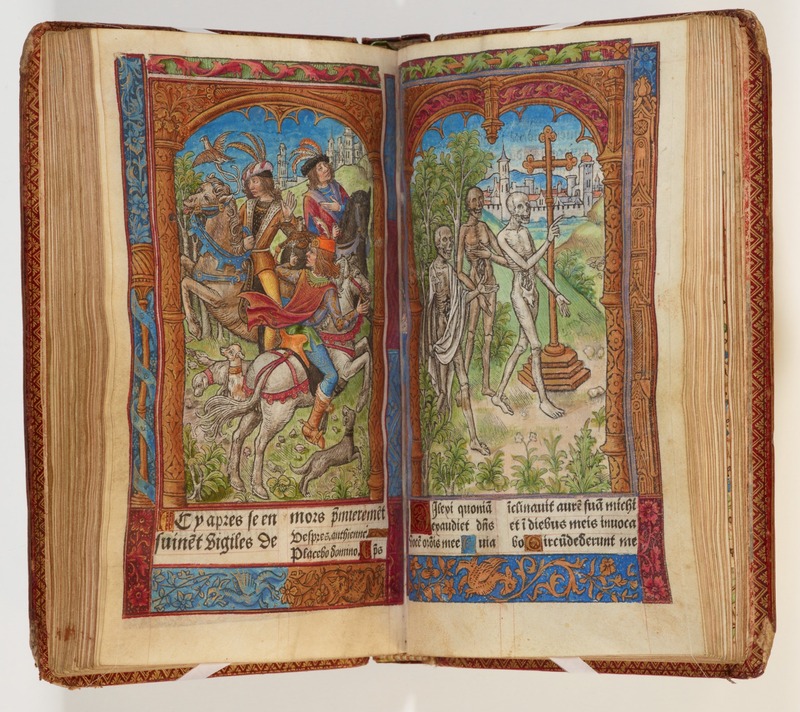 The catalogue will be launched in October, alongside a major exhibition on the use and abuse of books in the first century of printing: look out for more posts in the near future as the curatorial and conservation teams prepare for this exhibition.